Char-Broil’s propane-fuelled grill features three individually controlled burners that produce a cooking heat output of 36,500 BTU in the primary cooking area. It also has a flush-mounted 12,000 BTU side burner that is great for toasting hot dog rolls or burger buns, and features a second side-mount for additional food preparation space. Affordable, and robust, this unit is constructed from black, powder-coated steel, with a porcelain-coated steel lid and firebox, making cleaning a breeze. Also porcelain-coated, the wire grill-racks provide a 380 square-inch primary cooking area and a 174 square-inch secondary raised cooking or warming area. A hideaway metal shelf keeps the unsightly propane tank and tubes out of sight, and six-inch wheels make this grill easy to move. Char-Broil claims that this model of grill features “fast and EZ assembly”, which most customers seem to agree with. One customer reported that all that he needed was a mallet and a Philips-head screwdriver.It took under an hour to construct because all the screws were already in place and just needed tightening after the various parts had been slotted into place. It was also noted that the side-burner needed to be connected in order for the main burners to work. Aesthetically, the black porcelain-covered steel is attractive, and the lid-mounted temperature gauge adds to the visual appeal. Sturdy temperature-control knobs are mounted in front of the main cooking area. It is also very compact when compared to similar three-burner model grills. 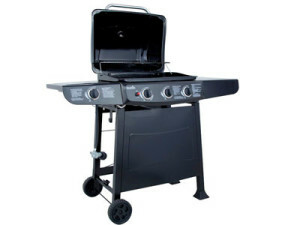 Customers have commented that this is a very reliable grill, but others have stated that the construction quickly deteriorates in damp conditions and soon becomes less stable. Some buyers have also had paint flaking issues within a relatively short period of time. Some people who bought this grill complained about the poor-quality of the regulator and the difficulty they had installing the liquid propane tank. A common concern was that, while the grill is mounted on six-inch wheels, there isn’t a dedicated handle for moving it, and that using the food preparation shelf caused it to become loose. The push-button Piezo ignition system provides an easy way to light your grill, but customers have mentioned that the quality of this part deteriorates quickly and they have been left using matches attached to sticks, which need to be inserted into the firebox from underneath. It has also been reported that the sturdy-looking temperature control knobs also deteriorate and soon are reduced to being able to only turn them halfway. The heat is distributed evenly across the primary cooking area, and frequent users of this grill report excellent fuel efficiency. Being able to control each burner separately further decrease this grill’s fuel consumption and reducing its overall ownership cost. The 554 square-inch overall cooking area is perfect for large families or people who entertain regularly. It is possible to only light one or two burners for cooking smaller meals. Although the grill-racks are coated in porcelain, people who have cooked with this grill have said that, even after conditioning the racks, food sticks to them far too easily because they get too hot. Furthermore, there have been complaints about the upper-rack not staying in position very well, causing hot food to drop off, which is clearly a potential safety hazard. Several customers commented that it was a good feature that the grill-rack came in two parts as this made them easier to clean. Overall, this Char-Broil three-burner grill seems to be excellent value for money. Of those people who complained about rust and paint flaking off, many also said that their grill had been left outside unprotected during wet weather. This is easily avoidable by storing your grill under cover. Following the manufacturer’s recommended maintenance schedule, further reduces the incidence of deteriorating parts.